On Jan. 22nd team Fauquier participated in a Double Dual five team event at Robinson HS. where they went head to head with two non-ranked Fairfax schools. 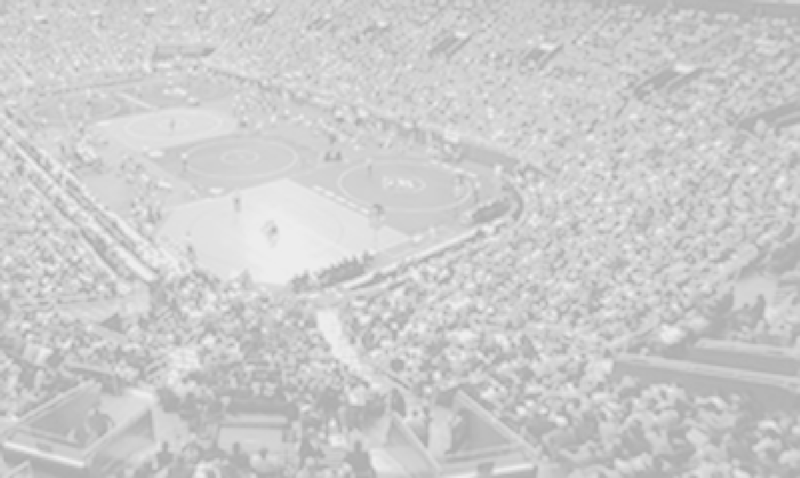 A wrestling meet that was scheduled for the day before (Wednesday) but was postponed to Thursday as snow would cancel all after school activities. Attending this event in past years Fauquier intent was to always compete with the best and had wrestled against Robinson in past years - even while the Rams held the number one state ranking status. 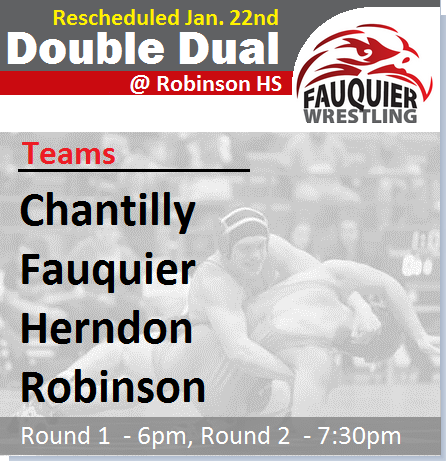 On this day Coach Hazard – the Robinson HS head coach made meet adjustments to team Fauquier as they would not have a dual and wrestle the Robinson Secondary school as they had in past years. Instead, the Falcons were aligned with bouts verse Herndon and Chantilly high school for this Thursday night Double Dual. With two mats on the gym floor the feeling on the Falcons bench may had been disappointed to know that they were not slated to wrestle the defining 6A State Champs. But no adjustments would be needed in this case as the Falcons ended the day by going 2-0 and improving its total season wins to 22. In round 1 Fauquier simply man handled Herndon HS. 61-18 by posting 11 wins and 2 loses. In this match team Fauquier continue to show strength by earning 7 pins with 2 forfeits. A match that started at the 106 pounds weight class had the Falcons winning the first 9 bouts. In round 2 once again found Fauquier pounding Chantilly HS with an a score 50-19. Team Fauquier had wrestled Chantilly in a dual meet back in December with similar results. Although team Fauquier would be without their heavy weight for both matches Coach Fisher must had known team would still do well with this void. Again Fauquier would start strong by winning the first 9 of 10 matches as they would finish with 10 wins with 3 pins. The match would end just as it started Kyle started with the 106 pounds weight class Kyle Budd pinning Reaves Arnold in the second period. This dual also had two individual forfeits and a win by injury default. Kyle Budd, Ty Foster, Camden Franklin, Kyle Roche, Matt Raines, Garrett Tingen, Clifford Harrison, and Eric Lemus all would go 2-0 as Joe Del Gallo, Daniel Ariola, and Trevor Marable all posted a victory (1-0).